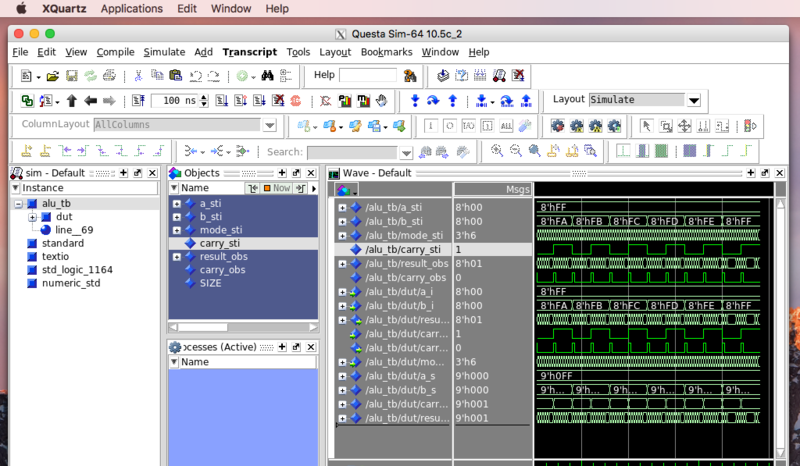 When doing HDL simulation Questasim is one of our main tools. However it only runs on Windows and GNU/Linux. 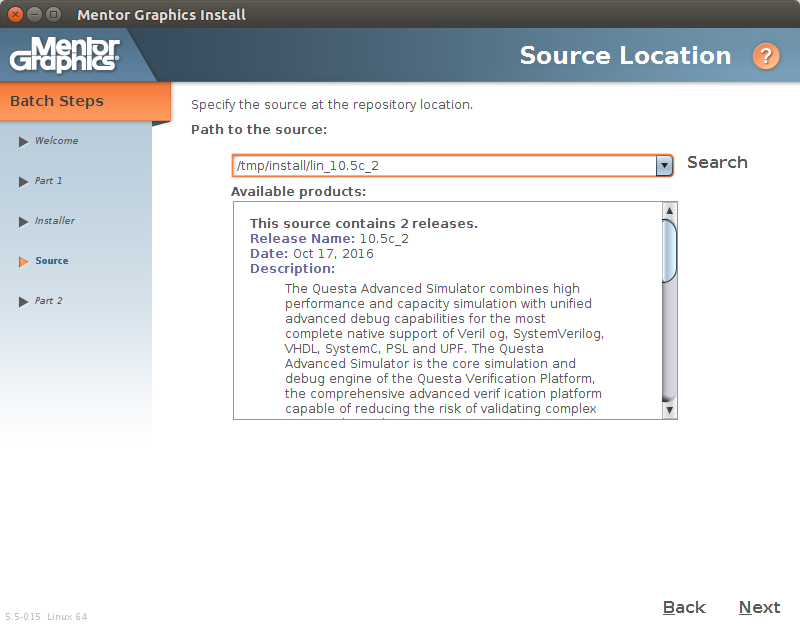 Although we mostly use GNU/Linux machines Questasim is not compatible with all distributions. This mainly because of library version compatibility, albeit this being fixable, it is a pain to do (find out which library is the culprit and which version is needed). So creating a Docker image seems like a good solution. 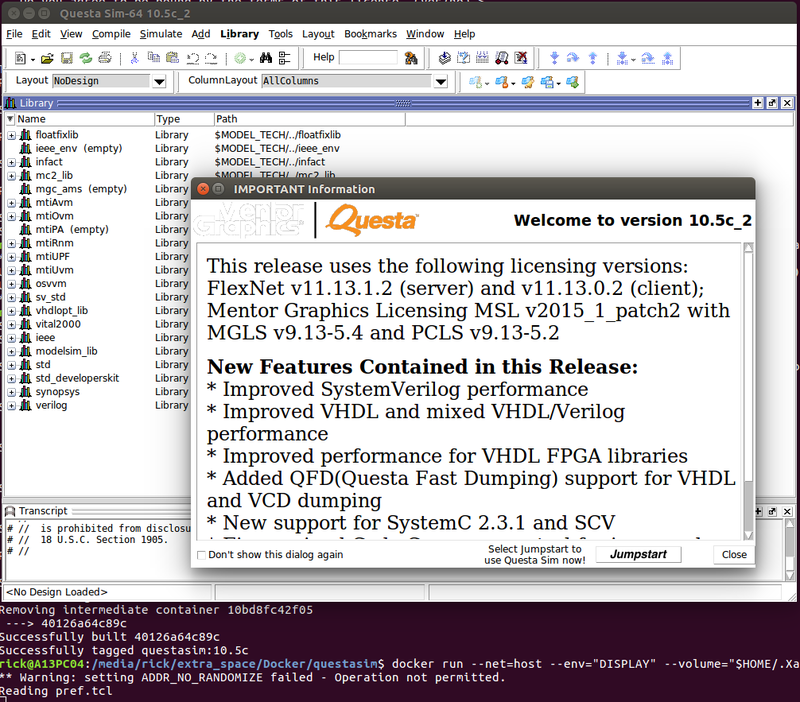 It provides a known fixed environment to Questasim and allows us to run it on any machine. 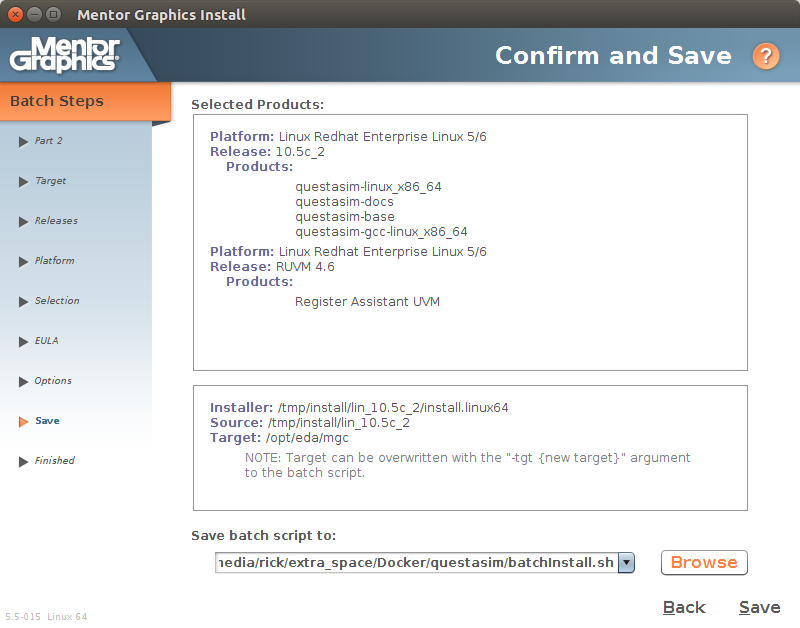 Questasim has a graphical installer (based on java) but it also provides a tool to generate a batch install script. Let’s do this. 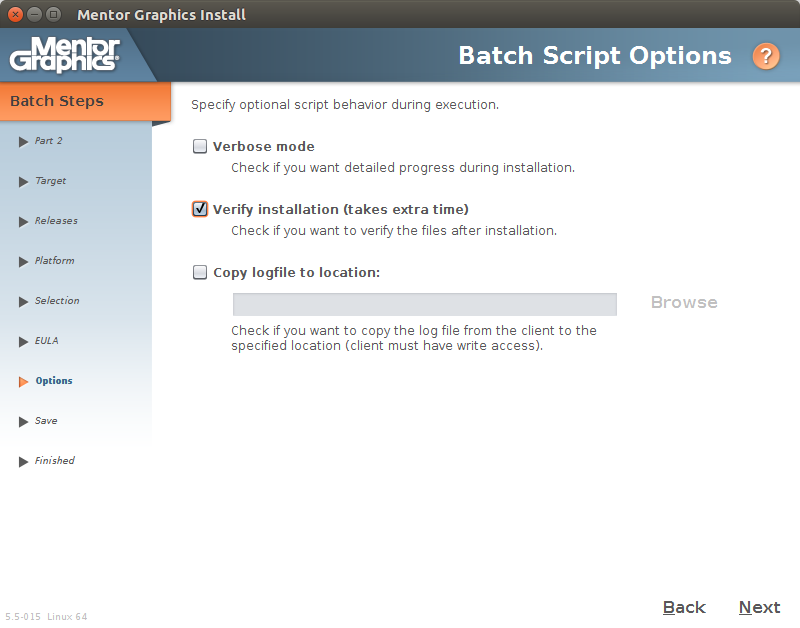 Launch the graphical installer and choose the “Batch Tool” option. 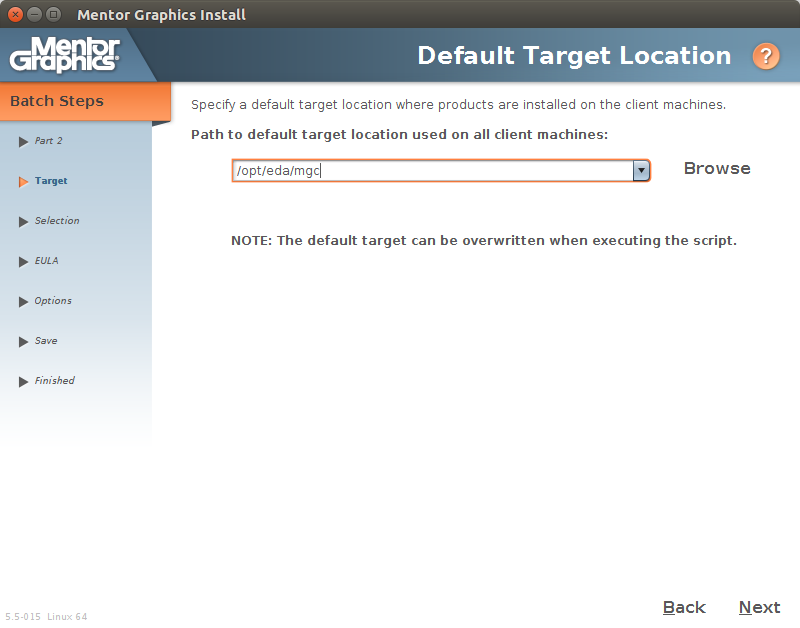 Choose the path for the installation on the client machines (our Docker image), we use /opt/eda/mgc but any path will do. Select Linux Redhat Entreprise Linux 5/6 as the operating system. 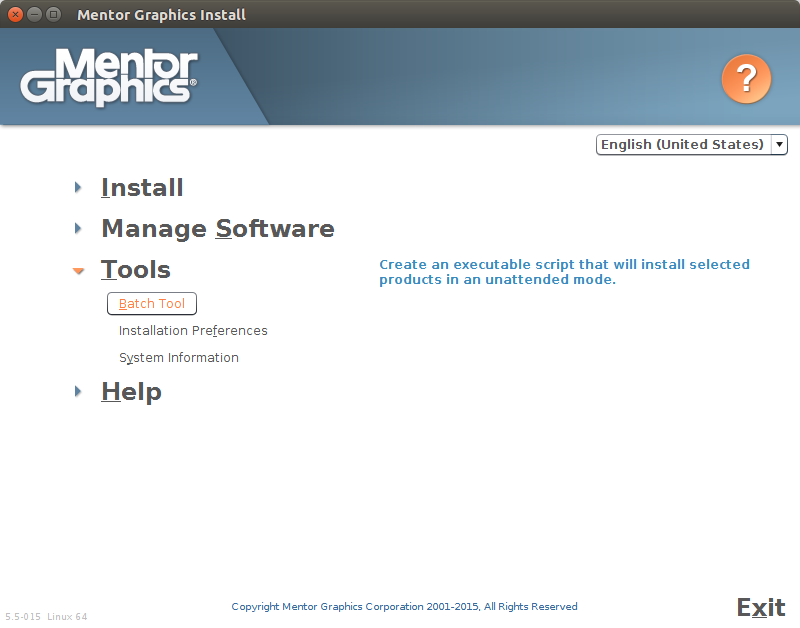 Select all products you want to install. There is no need for the verbose mode during installation, I checked verify to verify the integrity of the files after installation but this can be omitted and you can keep the log file if needed. You now possess a script to install Questasim without going through the GUI. I chose ubuntu 16.04 as a base for this machine since I had good results with Questasim on that particular version. (Newer versions required fumbling with libraries to make it work). Be careful with spaces in the installation paths since they make your life much harder and even when surrounded with double quotes they may cause problems in subscripts such as the Questasim installer. The Dockerfile installs the needed libraries and software, then copies the installation folder and the installation script. Once this is done the install script is launched and Questasim is being installed, when this is done the installation folder is removed. Note : It is also possible to simply copy an existing installation of Questasim from another machine, this will work too but is a bit dirty. docker build -t questasim:10.5c . 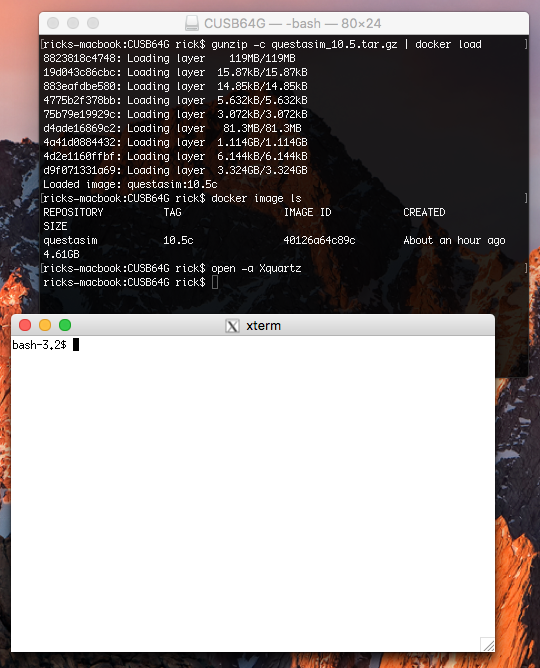 You should have a directory lin_10.5c_2 with the Questasim installer and .mis files in the same directory (else adapt your Dockerfile) and the batchInstall.sh file we generated, see the tree below. It is a whitelist, I block everything except the files marked with a bang ! 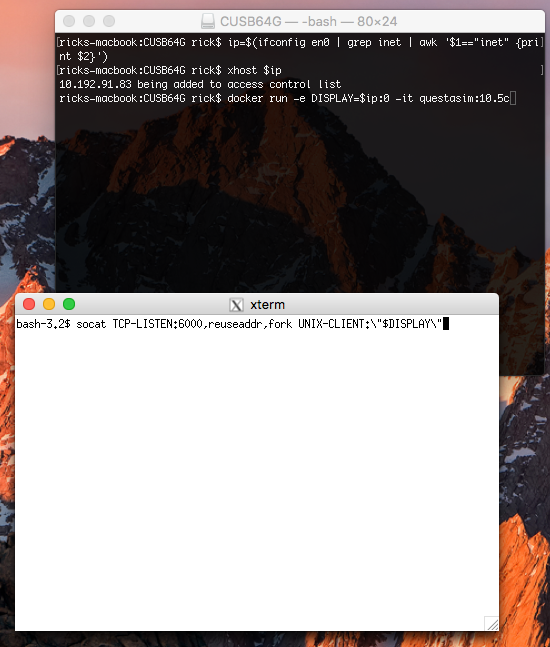 Now that everything is installed and the image ready you can run Questasim with the following command. And voilà ! 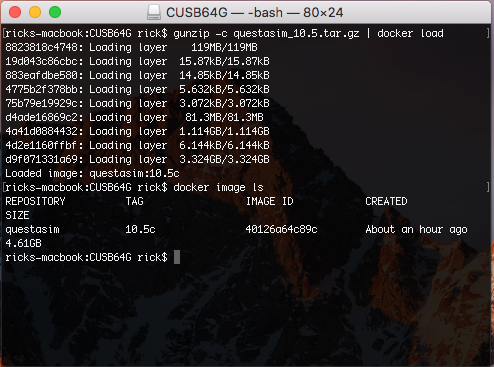 Questasim is running through Docker. (Depending on your X11 config you may need to accept connections, you can add them with the xhost utility program). The –net=host option is to connect to local ports/services, this is required to share the connection with the X11 windows server, we also need to share the DISPLAY environment variable and the .Xauthority file (ro – read only). We can add a volume to share data between Questasim and the host. Here I added ~/Projects/hdl/verification/exemples and mapped it to /input in the Docker container. Note the added -u `id -u $USER`:`id -g $USER` option, this is to change the user ID (UID) and group ID (GID) so that it matches the user on the host system, since Questasim can write in the shared volume we don’t wan’t it to write as user root but rather as the same user that launches the docker instance on the host. We can save the image directly to share it with other computers without the need of installing again. The installation will require that you log out and log back in (or reboot). We also need the socat (SOcket CAT) utility to relay the X11 connections to XQuartz. Now that we have everything we need, let’s load the Docker Questasim image. This may take a while again (especially if you own a puny macbook 12). 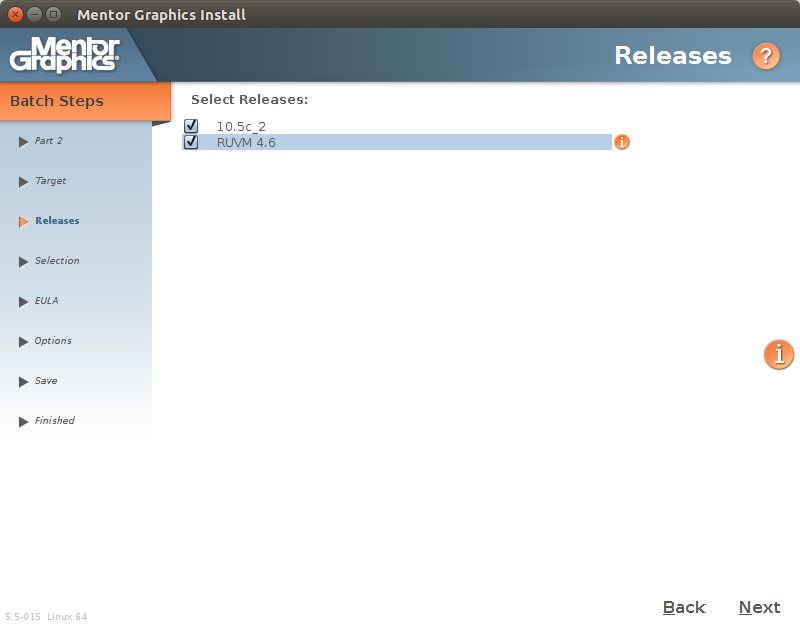 Then open Xquartz to launch the X11 server. Now we need to relay the network on port 6000 (The standard X Window port) I launched this command in xterm. We need to provide our IP to the Docker container X11 client to be able to connect to the X11 server. I use grep/awk to get my ip through ifconfig. And finally launch a Docker container, providing the IP followed by :0 in the DISPLAY environment variable, this will tell the X11 clients to connect to that server (display 0). Note that you should also change the user with the -u `id -u $USER`:`id -g $USER` option if you will be writing in the shared volume. Great ! Everything runs fine ! 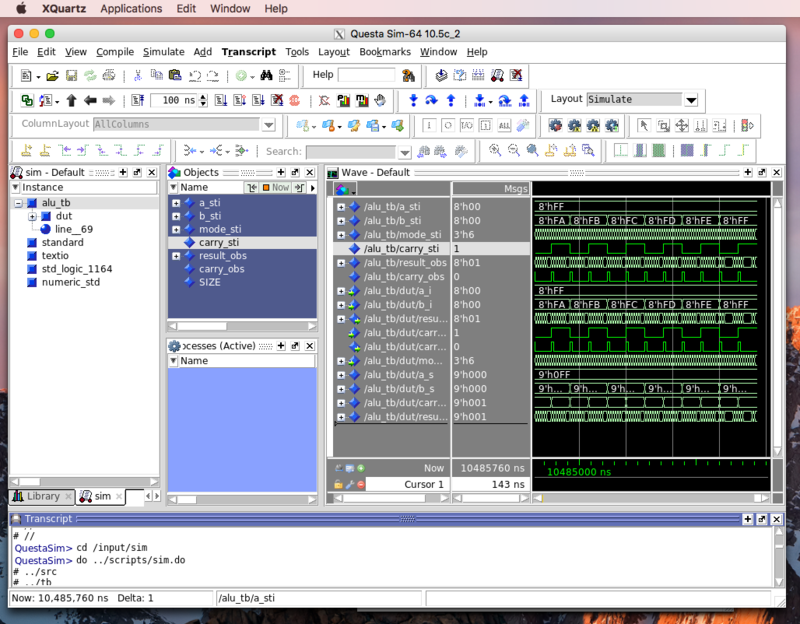 The same is possible for other software such as Vivado, with a Docker image containing Vivado I can run it on Mac OS X and I should even be able to program FPGAs via Mac OS X since you can share the /dev entry of the JTAG probe as a volume. The major pros are keeping your machine clean, no junk installed, once you remove the Docker image your computer is as clean as it was before, when you install the software natively there is often junk left behind even after an uninstall. Another pro is that an update of your OS will not break the Docker encapsulated software, as it would have done if installed natively (e.g., going from Ubuntu 16.04 to 17 or 18.04 will break Questasim and require you to install specific libraries). A con could be the extra layer slowing down the execution (this is very minor with Docker, you don’t have to run an entire OS as with a VM). I did not fell any major slowdown. I should benchmark Vivado synthesis on a Docker image, but from the tests I’ve done it runs almost as fast and can use multiple processor cores as with the native installation. Virtual machines take a ton of space due to the installation of the entire OS you are running the software on. So your Docker image doesn’t eat so much of your space. Virtual Machines can become unstable over time, since the same immutable Docker image is instanciated when launching a container you don’t have this possible unstability over time. Plus the docker image is only used for one software so there is no harmful interaction possible between your software and other software, or library upgrades that break you program. As hardware engineers we don’t always keep up with the latest virtualization technologies and OS independent tools, however we should. Docker is a nice way to make os dependent tools os independent. This also keeps things confined and is easy to install or remove (docker load / docker image rm). 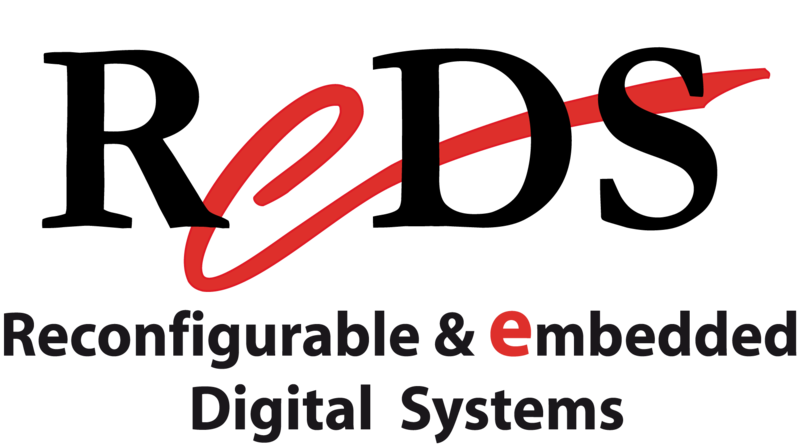 A possible improvement on the steps above would be to encapsule the steps needed to launch the software in a executable script. I hope this is useful and let us know what you think ! Pretty cool stuff. I’ve been asking myself for a while now when somebody would start putting EDA tools on docker. To be honest i think it’s a little overkill. Extra admin for what? 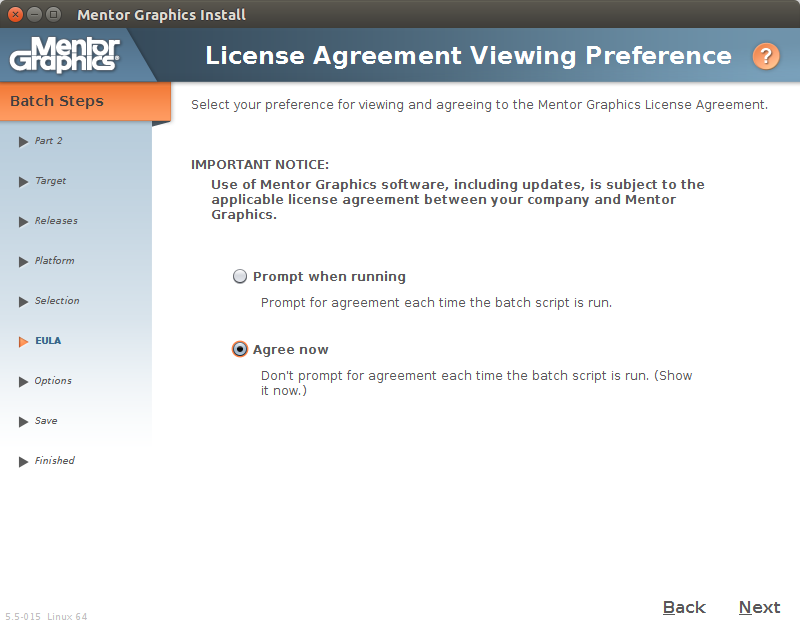 I’d rather have a bare metal redhat box with an anaconda script to setup the os packages. 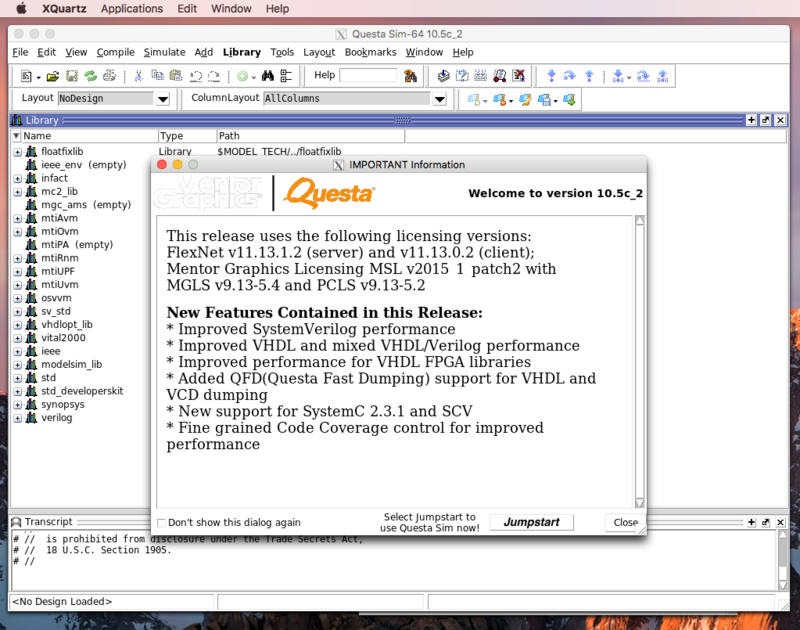 Install and Mount questa and whatever other tooling (vivado, quarus etc) from an nfs share. All. I need to version control is the anaconda scripts and my project scripts. This way I get bare metal performance. Good article though, nice to see progress. That seems like a sensible way to do it, however imagine this scenario. or if they have Docker, simply share the image with them. This way they can run it on any machine. On latops, macbooks, etc. 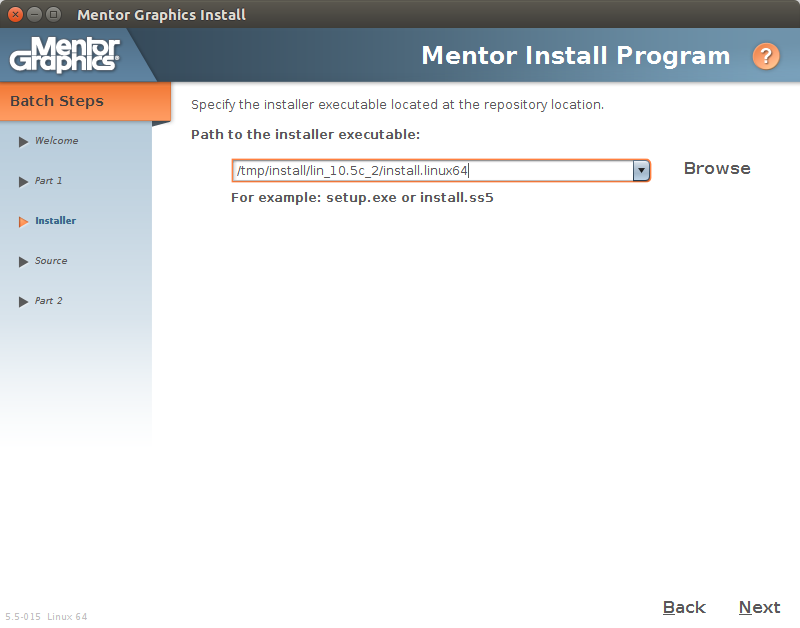 The installation takes only minutes and after the course uninstall is easy. I does work on Windows 10 too. I have successfully used a similar approach for some years now. I use x11docker to automate the configuration of the X11 server. 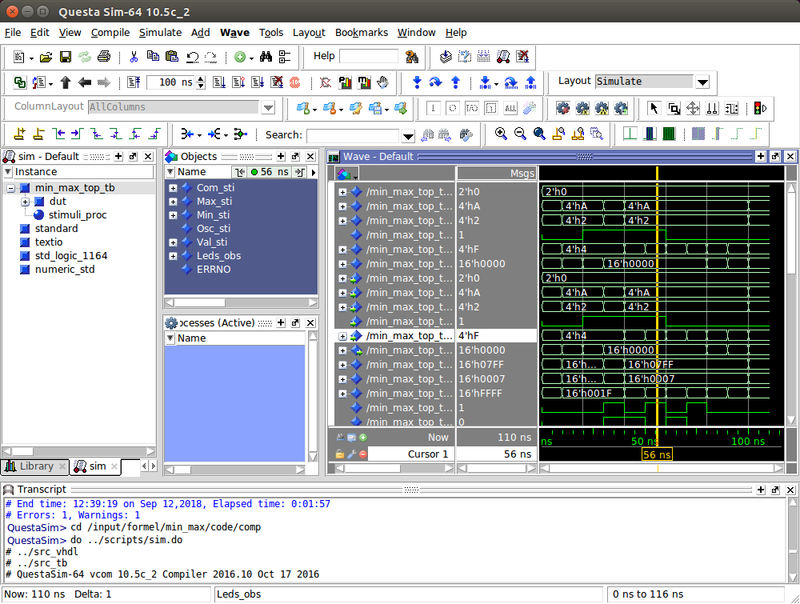 The same command works on linux or windows, and it allows to ‘ encapsule the steps needed to launch the software in a executable script’. Mac is not supported yet.